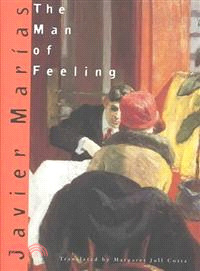 Glinting like a moonstone with layers of emotion, The Man of Feeling is a sleek and strange tale of cosmopolitan love. An affair between a married woman and a young man just becoming an opera star (curiously helped along by the husband's factotum) meets with adamant resistance from the implacable husband. Narrated by the young opera singer, the novel opens as he recalls traveling on a train from Milan to Venice, silently absorbed for hours by the woman asleep opposite his seat. In the measured tones of memory, The Man of Feeling revolves on the poles of anticipation and recollection. The peculiar rarified life lived in the world's luxury hotels, a life of rehearsal and performance, the constant travel and ghost-like detachment of our protagonist adds a deeper tone to the novel's weave of desire and detachment, of consideration and reconsideration: its epigraph cites William Hazlitt: "I think myself into love,/And I dream myself out of it." As Marias remarks in a brief afterword, this is a love story "in which love is neither seen nor experienced, but announced and remembered." Can love be recalled truly when it no longer exists? That twist will continue to revolve in the reader's mind, conjuring up in its disembodied way Henry James' The Turn of the Screw. Beautifully translated into English for the first time by Margaret Jull Costa, this fascinating and eerie early novel by Javier Marias bears out his reputation for the "dazzling" (TLS) and "startling" (The New York Times).